This celeriac soup from You Magazine is the perfect winter warmer, and is one of our favourites to make at this time of year. The flavour of the celeriac is celery-like with nutty undertones, while the consistency is creamy and delicious. The pesto also adds a fantastic crunchy texture and earthy flavour. You can make this soup a few days ahead, and it also freezes well so is great to keep a batch of for a cold, rainy day. You could also add a crumble of crispy pancetta on top with the pesto for added flavour and crunch. Place a heavy-based saucepan over a medium heat and add the butter. Once the butter has melted, add the celeriac, celery, onion and whole hazelnuts, and season with salt and pepper. Stir well, then reduce the heat to low, cover the pan with foil and pop the lid on. Leave the vegetables to sweat for 15 minutes. Add the chopped sage to the extra virgin oil in a small bowl. 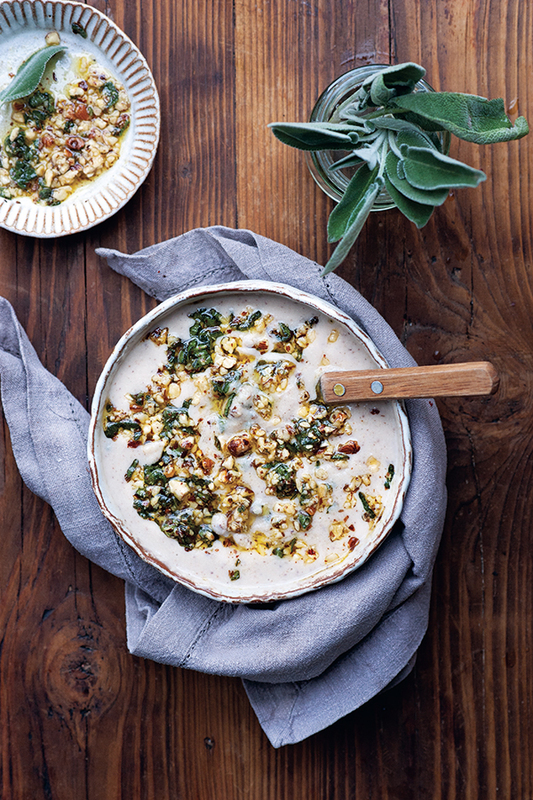 Serve the soup in warmed bowls with hazelnut and sage pesto drizzled on top.